Today is a gorgeous day in New York City and the start of a beautiful stretch of weather in the coming days. Without a doubt people will be spending time enjoying the outdoors. 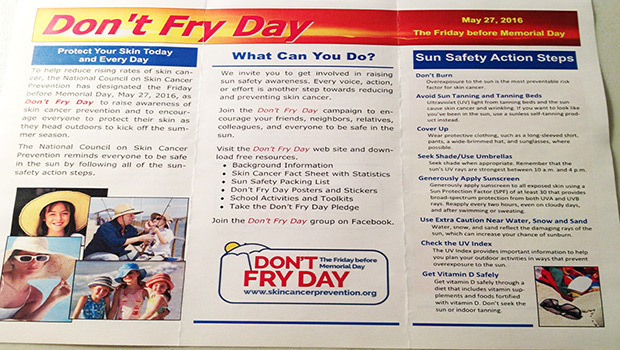 The National Council On Skin Cancer Prevention wants to remind everyone to practice sun safety while out today and everyday and has made tomorrow, Friday, Don't Fry Day. The goal behind Don't Fry Day is to help create awareness towards practicing sun safe behaviors all to reduce the rate of skin cancer which in past decades has increased over 100%. We know that ultraviolet light exposure plays a large role in the cause of skin cancer and the more we do to lessen our exposure, the more prevention we practice. Remember skin cancer affects us all and every one can do their part to help reduce its incidence. Visit the Don't Fry Day website to download free resources to share with friends, family and colleagues.